El artista anteriormente conocido como Prince acaba de confirmar su presencia en la novena edición del Coachella Valley Music and Arts Festival, el cual se llevará a cabo del 25 al 27 de Abril en Indio, California. Prince será el hedliner el sábado 26, día en el que también participarán Portishead, Kraftwerk y Death Cab for Cutie entre otros. 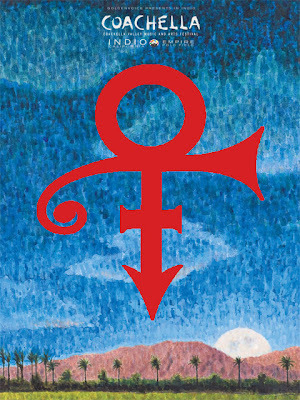 El más reciente álbum de Prince, Planet Earth, fue lanzado en Julio del año pasado. Roger Waters • Jack Johnson • Prince • Portishead • Kraftwerk • the Verve ● the Raconteurs • Death Cab for Cutie ● Love and Rockets ● My Morning Jacket • Aphex Twin • the Breeders • Justice • Café Tacvba • Fatboy Slim • Spiritualized • Tegan and Sara • Goldfrapp • Serj Tankian ● the Swell Season ● Sasha & John Digweed • Gogol Bordello • Rilo Kiley ● Chromeo • Dwight Yoakam ● M.I.A. • the National● Metric • Hot Chip • Cold War Kids • Animal Collective • Kate Nash ● Múm • Slighty Stoopid • Stephen Malkmus & the Jicks● Above & Beyond • Danny Tenaglia • Pendulum ● DeVotchKa ● Booka Shade • Simian Mobile Disco • Sharon Jones & the Dap-Kings ● Murs • Stars ● Flogging Molly • Mark Ronson • Redd Kross • Dimitri from Paris ● Battles • Autolux • Aesop Rock • the Field ● Les Savy Fav • Scars on Broadway • Linton Kwesi Johnson● Midnight Juggernauts • Islands • the Cool Kids • Does it Offend You, Yeah? • Enter Shikari • Sons & Daughters • Minus the Bear • Sia ● Calvin Harris • Holy F*ck • Spank Rock • dan le sac Vs Scroobius Pip • Boys Noize • Black Kids • Diplo • Junkie XL • Black Mountain • Adam Freeland • Annuals • Cinematic Orchestra • Santogold ● Jens Lekman • Kid Sister with A-Trak • the Teenagers • John Butler Trio • Duffy • I'm From Barcelona ● Vampire Weekend • VHS or Beta • Deadmau5 • Carbon/Silicon • Manchester Orchestra • Dan Deacon● Erol Alkan • Architecture in Helsinki • Man Man • Sandra Collins • Yo! Majesty • AUSTIN TV • Busy P • Little Brother • Cut Copy • Shout Out Louds • Bonde Do Role • Plastiscines • Black Lips • St. Vincent ● Brett Dennen • Datarock • Akron/Family • MGMT • Professor Murder • Surkin • Para One • Orgasmic Curses • James Zabiela • the Bees • SebastiAn • Kavinsky • Porter • Rogue Wave • Dredg • the Bird and the Bee • Yoav • Modeselektor • Grand Ole Party • 120 Days • American Bang • Luckyiam • Electric Touch • Yelle • Uffie featuring DJ Mehdi.